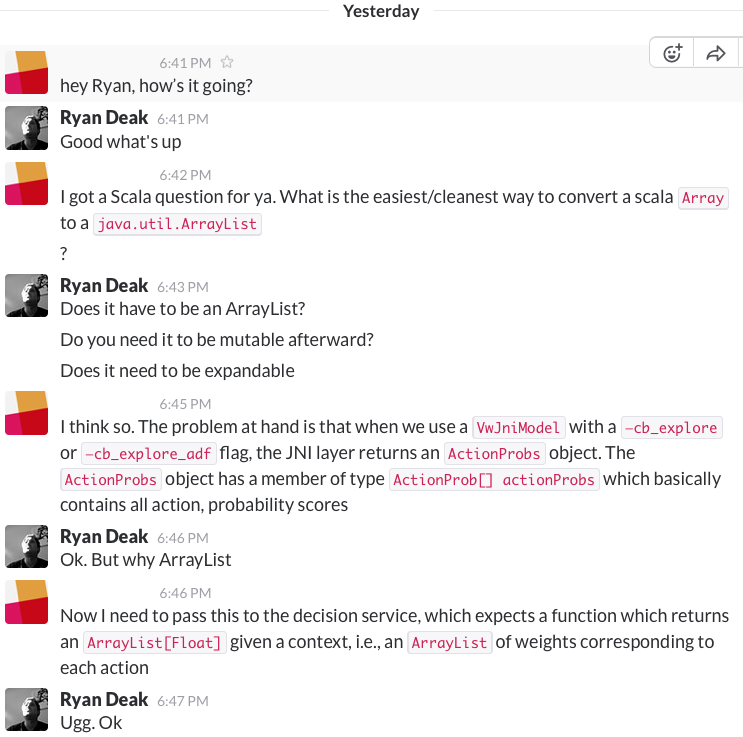 The other day I was talking to my colleague about an elegant way to convert a Java array to an ArrayList. For some reason, this immediately set off red flags in my head. As you’ll see in the chat log below, I immediately responded with a barrage of questions. Aloha, the machine learning and feature extraction library I wrote, has integrations with Microsoft’s Multiworld Testing (MWT) java library to help with the logging of exploration data. When my colleague mentioned Vowpal Wabbit’s ActionProbs, I realized that he was referring to the interactions with the MWT code. After staring at the Scorer interface for a second or two, I thought “why?”, echoing back to the chat I just had. I was thinking “it’s weird how specific this API is”. There’s no reason that one could possibly need an ArrayList at an API level. The OOP programmer in me thought “no one should care that much about the implementation of a list.” What the user really cares about is a random access List. return (L) floatsList;  // Compiler issues "Unchecked cast" warning. BUT the whole point of this article, and for that matter type systems themselves, is that APIs and interactions with APIs shouldn’t involve an honor system, but rather, should be encoded in the type signatures provided by the API. So while APIs like the Scorer API are most likely too precise and APIs like Arrays.asList are imprecise, providing the proper amount of precision is difficult in Java when it involves the interaction of two or more orthogonal interfaces. So what can be done? Scala, which runs on the JVM, has much better facilities for such types due to support for multiple inheritance and mixin composition. So while properly encoding these APIs in Java was hard, it’s rather easy in Scala. // Easily return an intersection type. // Easily require an intersection type for an argument. It’s important to think about the specificity of APIs and only require of the user what is necessary. Presumably this should involve programming to interfaces, but this is rather hard to guarantee at the type-level in Java. This has led to Java APIs that are either too specific or rely on the honor system rather than the contractual requirements of the APIs themselves. A richer type system like Scala’s type system can overcome these deficiencies, thereby allowing API developers to ask for no more than is necessary (even when requesting multiple orthogonal constraints). The ultimate consequence is that API developers will develop more general libraries and will avoid pigeonholing API users into specific implementations. This really seems like a win-win situation.